No Way Jose’s in Pigeon Forge is the perfect date night! 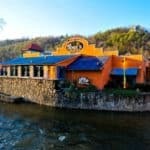 Enjoy one of the many attractions in Pigeon Forge and head over to No Way Jose’s for a delicious meal and margaritas. To make date night even better, there are many shareable entrees and desserts! Get in the spirit of Valentine’s Day and share your meal with your date. Worried about not getting enough food? These generously sized mouth-watering dishes will be just enough food for two! Corn Tortilla Chips topped with Seasoned Ground Beef, Pickled Jalapenos, Black Olives, Green Onions, Diced Tomatoes, Refried Beans, Chile con Queso, Ranchero Sauce, Shredded Lettuce and Sour Cream. Chicken, steak, shrimp or Caribbean veggie fajitas are the perfect entree for date night! Vanilla Bean Ice Cream coated in sweetened Corn Flakes and Ground Cinnamon. Deep fried and topped with Chocolate Sauce and Whipped Cream. Stay up to date on all specials and promotions by following our social media.